Michael Scarth was born on 10th October 1766 in County Durham, England the illegitimate child of a man named Stott. He married Ann Lane, a farmer’s daughter, at Castle Eden Church in 1791. He was the father of 5 boys and 3 girls. He died of typhus fever at the age of 39 years in Sunderland on 20th November 1805 and was buried at Castle Eden. We know these facts from documents in the possession of a direct descendant of Michael’s youngest son. Thankfully, included among those documents, Michael left a Biographical Sketch for the information of his 8 children. Land Steward to Rowland Burdon – 18th July 1790. Land Steward to C Brandling – February 1791. Partner in Patent Ropery with Messrs Grimshaw, Webster and Hills. Partner in Castle Eden Manufactory with Messrs Webster Junr. and Wilson. Third Partner in Bridge with Messrs Burdon and Wilson. Sunderland to Durham by election. Chairman of Comm. for Bridge foundation stone laying procession. Resigned all offices in the lodge excepting as Trustee of Committee of the School. NB His resignation from all lodge offices in the lodge seems very strange but at this time he would be heavily involved in the formation of Chapter of Strict Benevolence and the school. So the exertions of another valuable individual, should raise the drooping spirits, restore the accustomed vigour, and infuse light and spirit into all the future proceedings. In the year 1791 the late Michael Scarth, Esq became a member of the lodge. To a mind well informed, and a sound judgment, he joined a facility of application and steady perseverance, that would not easily abandon a design, while any advantage could be procured to it, or, indeed, while the minutest part of it appeared unaccomplished. As soon as he was elected to an office, he resolved to use his influence and exertions, to raise the lodge to its former level. He commenced by improving the rules and by-laws of the society, for which purpose, he visited the different lodges in the neighbourhood; consulted their various regulations, and from them, compiled and composed a code, adapted to secure every fraternal and scientific purpose of the institution. You may note from the above section on his Private Career that Michael Scarth, among numerous other activities, was a partner with Messrs Grimshaw, Webster and Mills in a Patent Ropery which was established in 1793 literally on the banks of the River Wear at Deptford, Sunderland. 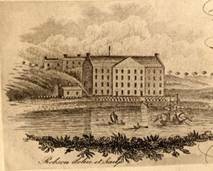 This was the first factory in the world to use the patent method called the ‘Fothergill Process’ (Richard Fothergill –a local man) which allowed ropes to be made without the usual long ropewalk. 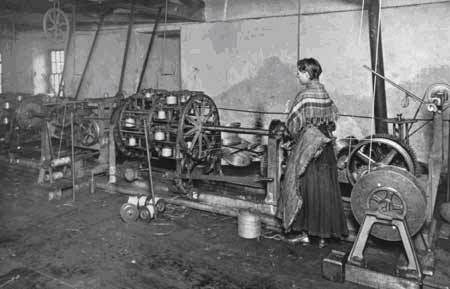 It was also the first to use a steam engine which was also labour saving and allowed flexibility in the hours worked allowing greater production at a lower cost. 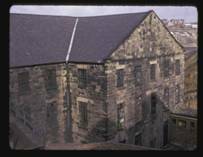 Built in 1797 by John Grimshaw and Rowland Webster, the original rope-works was designed to exploit the new technology of its day - a machine for spinning cordage which had been invented by a local man, Richard Fothergill. This invention had a revolutionary impact on rope haulage. Truly a world first and very timely given the demands being made by shipping, the war with France and the evolving Industrial Revolution. It is even more remarkable to realize that within another couple of years Scarth would be involved as 3rd partner in an even greater world beating enterprise just a few hundred yards down river from the Ropery – Burdon’s Iron Bridge!! It can be clearly seen from the above image that it is four storeys high and that at the ground floor level there are two arched openings with a set of three windows between them and a set of three windows either side of them. The photograph immediately below naturally shows the same configuration. The restored buildings showing the original factory in the foreground running parallel with the adjacent riverside. The smaller buildings towards the far end being the Bar / Restaurant known as “Webster’s” which were presumably added at a later date to the original main building. In the History section of the web site we detail the Masonic side of Michael's life, the influence he had as a member of Sea Captains Lodge and of how he prepared and planned to bring into being this Chapter of Strict Benevolence. Michael was the main founder and the original First Principal of this Chapter.